Description: "Kikko" is a rare unmistakable Japanese cultivar distinguished by its pointed tubercles along the ribs edges, in fact its areoles stick out with notches between them, giving them a saw tooth look. The furrows which appear transversely on the ribs cuts the continuity of the ribs and the plants appears decorated with a geometrical design which is raised above the surface. 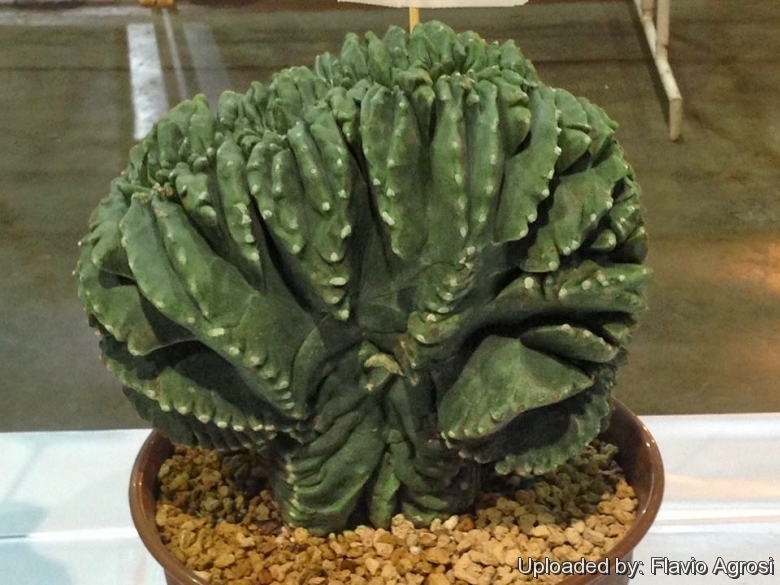 Crested form: The crested 'KIKKO' (Astrophytum myriostigma cv. Kikko nudum f. cristata) is one of rarest and pricey astrophytum cultivars. It is seldom seen in specialized collections and sought after by collectors, for its unique features. Though these crested myriostigma specimens are extremely rare, cresting occurs naturally, and can be encountered in many other cactus species. The cause of cresting is not fully explained and some speculate that it is a genetic mutation, but whatever the stimulus, the growth point of the stem has switched from a geometric point, to a line, which folds and undulates as the crest expands. Stem: Fan shaped, smooth, glossy green, blue-green, grey-green or mauve-green thin or thick (depending on clone) up to 30 cm (or more ) in diameter and height with age. Usually the seedlings appears nothing special and looks like normal myriostigma, and barely shows any trace of saw teeth, but they start to produce the distinguishing indentation and turn into an amazing adult as they get 3 to 7 years old. In general the bigger the "saw teeth" are and the rounder and flatter they are, the better. Ribs: Vertical, regular, deep, prominent and acute with pointed tubercles or notches, giving them a saw tooth look..
Cultivation and Propagation: Astrophytum myriostigma cv. Kikko nudum f. cristata is not too difficult in a greenhouse, although grows quite slowly. It is usually seen as a grafted plant but can grow on its own roots too.